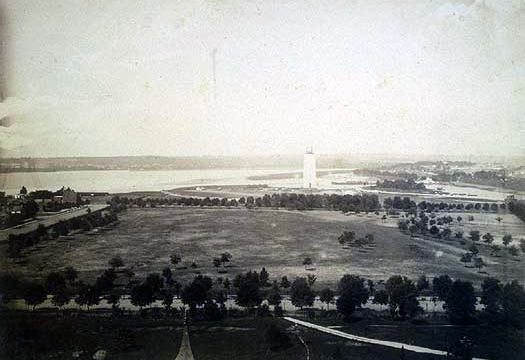 Titian Ramsey Peale, “Department of Agriculture Fields,” Histories of the National Mall, accessed April 25, 2019, http://mallhistory.org/items/show/372. In 1863, the Commissioner of Public Buildings offered the Department of Agriculture the land between 12th and 14th streets and North and South B Streets (today's Constitution and Independence Avenues) for use as an experimental garden for agricultural purposes. The land assigned to the Department was part of the Washington Monument cattle yards created to supply food to Union troops during the Civil War. After the Civil War in 1865, the Department grew test crops on the undeveloped spaces of the mall for over a decade. William Henry Seward Papers, University of Rochester Library, via Smithsonian Institution. View original.